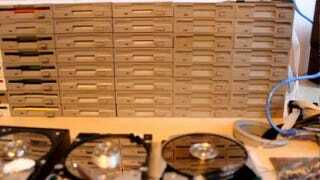 In a video posted to his blog on Wednesday, Zadrożniak shows off what he calls the “Floppotron,” a large assembly that includes 64 floppy drives and eight 8-channel controllers with envelope stimulation. Quite an improvement over his original two-drive setup. Over on his YouTube channel, you can listen to his Floppotron play the opening theme from the original Star Wars, along with the “Imperial March.” He also has videos where his setup plays “Smells like Teen Spirit.” Maybe he’s taking requests?